4.2 out of 5 based on 72 bloggers and 10 commenters. 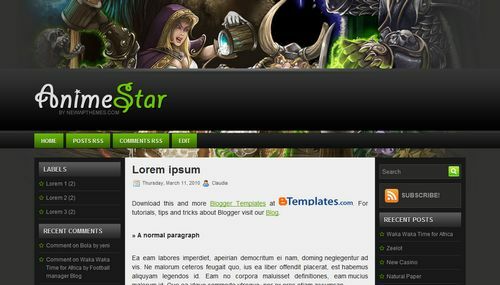 Anime Star is a free blogger template adapted from WordPress with 3 columns, left and right sidebars and ads ready. Excellent template for blogs about anime, entertainment or games. Nice, but the buttons need one upgrade, static buttons is very ugly. My friend buttons are working perfectly. you can get a perfect unedited copy from my site. How can i replace the header with my own? Or how to remove the remaining picture on the back of Home,Post RSS,COmments RSS? It must be 1024px × 415px and you may use some gradient effects in photoshop. I am working on making one. @Gigalpina: There isn’t a comment icon in the homepage… but the comment box appears when you click on each post title. How can I move the “header” over to the top of the page?